Welcome to the website of the Puerto Rico Section of the Institute of Transportation Engineers. Welcome to ITE Puerto Rico Section webpage! ITE is an international educational and scientific association that encourages education, stimulates research, develops public awareness programs and serves as a conduit for the exchange of professional information. The Puerto Rico Section is engaged in promoting the development of its members in all areas related to transportation and in the enhancement of the Puerto Rico transportation system. ITE has more than 13,600 members in 90 countries around the globe. The Puerto Rico Section has currently 40 members. Last year’s hurricane María also impacted our Section. Some of our scheduled activities could not be fulfilled as planned. Nevertheless, we had an overall successful year: our first strategic meeting, participation in the Transportation Week of the University of Puerto Rico – Mayagüez Campus, our successful Spring Meeting with multi-professional attendance, participation at 2017 Florida Section ITE Summer Meeting, ITE International Annual Meeting, and ITE-Leadership Program, among others. This 2018 will be a year for renaissance and excitement. 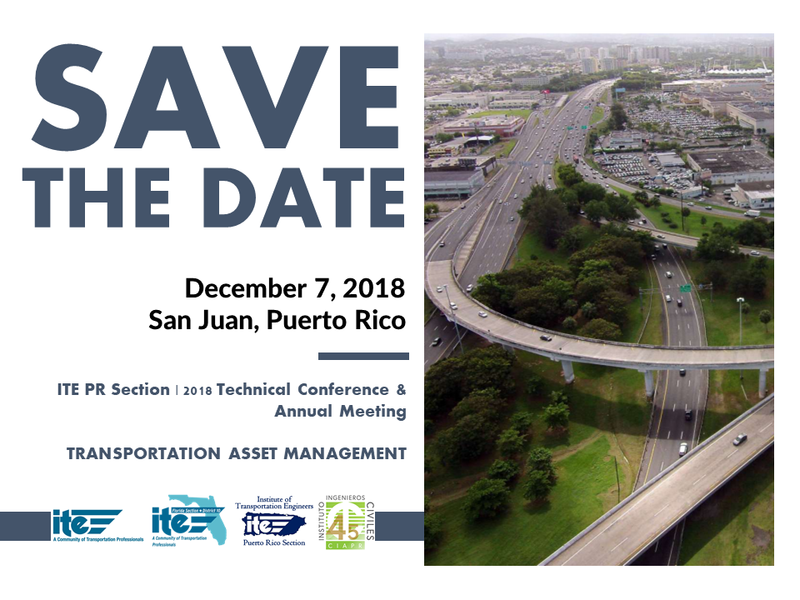 In addition to our usual great activities, we will be working towards the celebration of the ITE District 10 Annual Meeting at Puerto Rico in 2019. We invite all professional and community associations and individuals with interest in transportation planning, design, operations, construction, and safety to join us for the successful planning of this activity. Zaida E. Rico-Rolón, P.E., Ph.D.
2018 Technical Conference & Annual Meeting | SAVE THE DATE! Access to our latest newsletter and share with your transportation engineers friends!